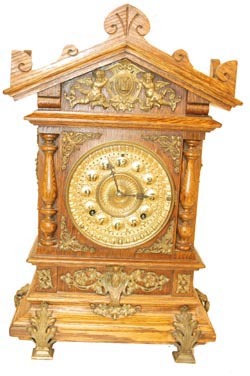 Ansonia Clock Co. mantle clock, "Cabinet C", C. 1894. Antique Oak with brass trimmings, stands 18.5" high. The top ornament, cupids and an hourglass, has several dates inscribed on the flowing sash around the cupids, such as, 1886, 1887, 1888, etc. which I suspect represents the passing of the years. On each side is one of the mythical gods, and another figure on the front bottom. Very nice original brass dial and sash. 8 day movement strikes a gong on half hours and is running just fine. Complete, original, and untouched. Ly-Ansonia #849.